A protest took place outside the BBC on Thursday evening to condemn the broadcaster’s minimal coverage of the Chapel Hill murders in the US, which saw three Muslim students shot and killed. Organizers say the BBC’s coverage of the Chapel Hill murders in North Carolina on Wednesday was tantamount to silence in comparison to the corporation’s reporting on the Paris attacks last month. 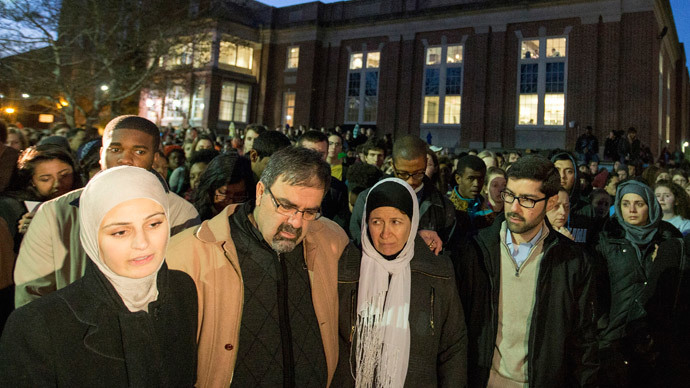 #MuslimLivesMatter trended on social media following the deadly shootings of Deah Shaddy Barakat, 23, his wife, Yusor Mohammad, 21, and her sister, Razan Mohammad Abu-Salha, 19. Craig Stephen Hicks, 46, turned himself in to the authorities and has since been charged with murdering the three university students. The slogan is inspired by “Black Lives Matter,” which for many summed up the palpable anger in the wake of the shooting of unarmed black teenager Michael Brown in Ferguson, Missouri, by a white police officer. Thursday evening’s protest, outside BBC Broadcasting House in Portland Place, central London, was organized by Stand up to Racism, a movement supported by Unite Against Fascism (UAF) and Muslim Engagement & Development (MEND). Sabby Dhalu, an organizer for Stand up to Racism, said Muslim people are often portrayed as the perpetrators of violence but rarely the victims. “Our condolences and thoughts are with the families and friends of Deah Shaddy Barakat, Yusor Mohammad Abu-Salha, and her sister, Razan Mohammad Abu-Salha,” she said. “We are saddened by the lack of media coverage in this case, which stands in stark contrast to the wall to wall top story coverage that the Paris shootings rightfully received,” she added. Dhalu said politicians were quick to blame the Muslim community following the Charlie Hebdo attacks in January, in which armed Islamists killed 12 people. #KillAllMuslims trended on Twitter as part of the backlash against the community without any international outcry, she said. Weyman Bennett, Joint National Secretary at UAF, said Muslims were becoming the “scapegoats” of society. The Muslim population of England and Wales increased by 75 percent from 2001 to 2011, according to a report for the Muslim Council of Britain published Thursday. Analysis of 2011 census data revealed the number of Muslims grew from 1.5 million to 2.7 million. Researchers at the University of Oxford found that the Muslim community tends to be economically disadvantaged, with just one in five Muslims in full-time employment. This figure contrasts starkly with the national average of one in three. Researchers found Muslims face a “double penalty” of “racial discrimination as well as Islamophobia” when trying to find a job.